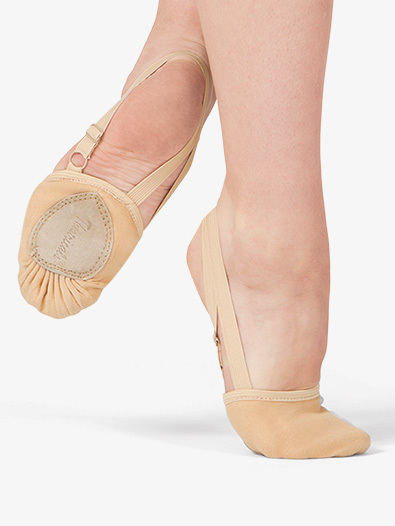 Perfect for lyrical, modern, contemporary, and ballet, this soft and durable canvas shoe provides support and comfort. Turn easily using the ballet construction complete with pleating and stitched suede sole. Adjustable soft elastic strap ensures a great fit, comfort, and provides peace of mind when dancing. A BEST VALUE Product. Sizes available for both large child and adult sizes. We are using them for a competition piece, and the girls love them. After reading reviews, I was under the impression that this shoe ran small. I purchased the next size up and they are simply too large for her to wear. Maybe in a couple of years. This is my daughters first year taking lyrical, although she has been in dance since for 10 years. These shoes are a slight adjustment, but they came recommended by her dance center and she really likes them. No complaints! The only reason I didn't give a five star is because want to see how they hold up through the dance year.